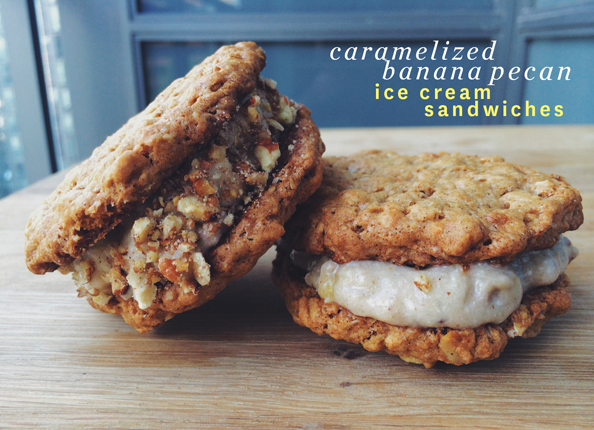 “THE IDEA FOR CARAMELIZED BANANA PECAN ICE CREAM SANDWICHES came from our love of banana ice cream or ‘nana’ ice cream as you’ll often see it called online,” explains MTV Canada host Lauren Toyota, who is profiled in our brand new Fourth Issue on page 34. 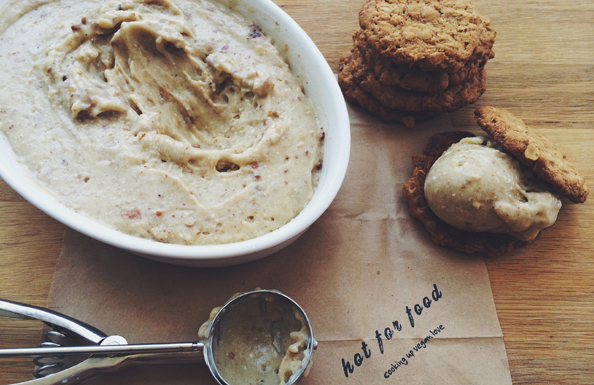 Along with her partner-in-kind John Diemer, the charming multi-tasker runs the popular vegan food blog hot for food. “John and I get inspired for recipe ideas easily and frequently because frankly, we eat a lot of interesting vegan food!” she says. Here, they share an exclusive recipe with LAIKA for this fun treat, which Lauren says routinely impresses their non-vegan friends, who are left wondering how a dessert this light and creamy can be achieved without dairy. “There’s something whimsical about the ice cream sandwich; it’s indulgent and youthful and you can have a lot of fun with flavours,” Lauren says. While this particular recipe does call for a bit of extra effort because of the caramelized bananas, Lauren encourages getting creative in the kitchen by also blending raw frozen bananas with ingredients like chocolate, peanut butter, various nuts, cherries, berries, or other fruits for endless days of ice cream all summer long, and beyond. Preheat your oven to 350F. In a large mixing bowl combine flour, baking soda, baking powder, and sea salt with a fork and set aside. In a separate mixing bowl and using a hand mixer beat the vegan margarine together with the brown and white sugar until creamy. Add vanilla extract, non-dairy milk, and banana and beat until well combined. Add the wet ingredients to the mixing bowl of dry ingredients and combine together using a wooden spoon, then fold in the rolled oats. Spoon approximately 2 tbsp of cookie dough for each cookie onto an un-greased baking sheet and slightly flatten it with your hand. These will spread out quite a bit so make sure you leave some space between cookies. Bake for 15 mins then allow to cool completely on a rack before assembling ice cream sandwiches. Heat a non-stick pan to medium. 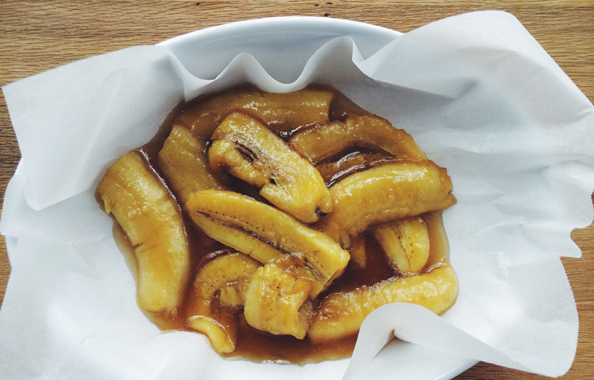 Slice the 3 fresh bananas length wise and place them in the pan with 2 tbsp of vegan margarine and maple syrup. Spoon the liquid over the bananas to get them coated and let the mixture start to bubble and caramelize. Once the liquid gets slightly thicker and more like a caramel remove from the heat and place the entire mixture into a parchment lined dish. Once it has cooled off freeze the mixture until it’s solid again. While this mixture is freezing you can make your cookies (as per above) and toast the pecans for the ice cream. Toast pecans in a non-stick pan on medium heat for approximately 6-7 minutes making sure to toss frequently. Allow them to cool, then chop into pieces with a knife or run them through a food processor. Set aside until you assemble the rest of the ice cream. Add in the two more frozen bananas and coconut cream. Run the food processor until the frozen bananas start to become like soft serve ice cream. You may need to stop the food processor and push the mixture to the bottom with a spatula a couple of times. Once the mixture is well combined you can transfer it to a serving dish or bowl and fold in half of the chopped pecans, reserving the other half for the outside of the sandwiches. To assemble the ice cream sandwiches, place one scoop of ice cream on the bottom of one cookie. Place another cookie on top and slightly press down until the ice cream is nicely spread out to the edges. Using your hand you can sprinkle chopped pecans to the sides of the ice cream. You can serve immediately OR wrap them in parchment and freeze to save for a later date. You’ll get a slightly different ice cream texture but it works. Just thaw the sandwiches for 10-15 minutes before serving. And, enjoy! Pick up our Fourth Issue to learn all about hot for food and Lauren Toyota, and find out how she is using her platform in television and entertainment to speak up for animals. Recipe and photographs in this post by Lauren Toyota exclusively for LAIKA.